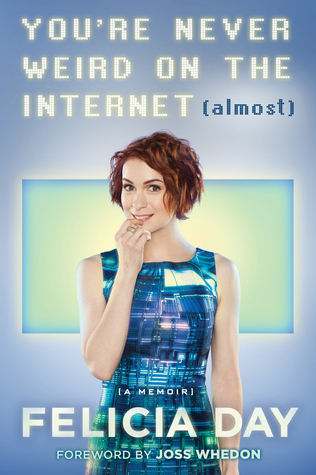 From online entertainment mogul, actress, and "queen of the geeks" Felicia Day, a funny, quirky, and inspiriting memoir about her unusual upbringing, her rise to Internet-stardom, and embracing her individuality to find success in Hollywood. The Internet isn't all cat videos. There's also Felicia Day - violinist, filmmaker, Internet entrepreneur, compulsive gamer, hoagie specialist, and former lonely homeschooled girl who overcame her isolated childhood to become the ruler of a new world...or at least semi-influential int he world of Internet Geeks and Goodreads book clubs. Hilarious and inspirational, You're Never Weird on the Internet (Almost) is proof that everyone should embrace what makes them different and be brave enough to share it with the world, because anything is possible now - even for a digital misfit. Powered through this puppy in a day and a half via audiobook. I'm loving the speed up option on Overdrive. Plus it was just a really fun memoir, and Felicia Day is a crack up. Unlike the books from comedians that I've been devouring lately (just finished Mindy Kaling's newest as well...review to come), You're Never Weird on the Internet is a true memoir. Felicia Day recollects her days as a strange, isolated homeschooler with an UBER supportive mother and later her new isolation as a female gamer in a "man's" world crippled by fear and the overwhelming desire to create. She's quick witted, insightful, and a bona fide genius. Really. The girl is wicked smart. She enrolled into college at the age of 16 and majored in math. You could be a 50 year old majoring in math and I'd think you were a genius, but a teenager? Geez oh pete. There wasn't nearly as much discussion about Dr. Horrible as I would have liked, but so it goes :) As her gaming obsession intensified, I often wondered when she actually worked. It made the timeline a bit difficult to follow, but it also made her emergence with the Guild and awesomeness with YouTube and the Geek and Sundry channel so very interesting. So amazing to think that YouTube is only 10 years old. Feels like it has been around forever. Whether intended or not, I finished the book with a greater appreciation for those who are willing to put themselves out there and share their creative endeavors with others. And for the weird and geeky who are just passionate about what they love unapologetically. A great read that I highly recommend.